Age 4 or 5 is a good age for parents to help their children build good character and develop traits like discipline and respect. Our Little Ninjas Program is specially designed to help children develop good moral traits, while at the same time having fun with new friends. This class concentrates on developing coordination, balance, focus, respect, and discipline of Tae Kwon Do, which they will also carry out at the school. They will become better students at school, better disciplined at home, and better individuals of society. This program focuses on improving basic motor and listening skills. Children will learn how to develop balance and coordination, while also learning positive character traits. Our Little Ninja Program is a fun program that also keeps your child excited with non-stop action and games. 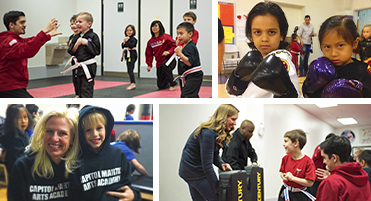 It's a whole-rounded program teaching children the fundamentals of Tae Kwon Do while having an exciting and healthy adventure along the way. They will be more confident each time they learn something new from the class. We give recognition to their attendance, achievement, and good behavior. Our instructors will guide your children to be more alert and confident to thrive in new situations so they may be at their very best in school and in all aspects of their lives.